I'm so glad you finally got the life you deserve. Being in a pond is the best place for you. You even get hand fed every day. Hi Bella! Happy Pet of the Day! 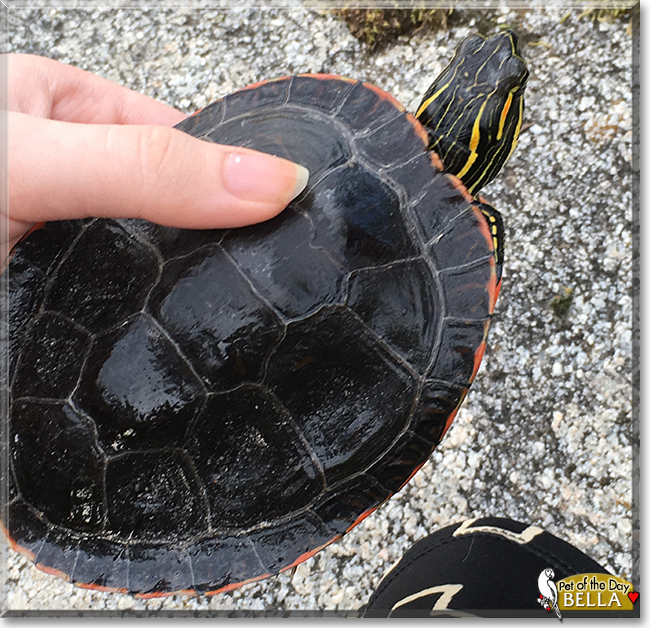 What a beautiful Western Painted Turtle you are, Bella! Your coloring and markings are stunning! And oh, what a very special backstory is yours! I always believed that classroom pets were meant to teach young children proper, responsible animal guardianship under the supervision of the teacher! Sadly that was not the case for you. Where was the teacher? Thankfully your Grandpa came to your rescue, taking you out of that horrible situation. And after a few years being tenderly cared for by your Grandma, you hit the Painted Turtle jackpot! You truly are living the good life now, Bella, swimming with the fishies and froggies in that koi pond, not merely surviving, but thriving! You even get to visit with your family during the summer, being hand fed, hehe! I know that makes you, and them, very happy! How lucky your family is, having a best friend as beautiful, as unique and special as you! You truly are a treasure, Bella, and so very deserving of your big day of honor! Thanks for the BIG smiles, sweetheart! Meeting you today, reading your rags to riches story and seeing your gorgeous photos, has been a real treat! I hope you're enjoying a very special day of celebration, sweetheart, being loved and pampered to pieces! Lots of love to you, beautiful Bella, our very special and most deserving Pet of the Day, EVERY day! Dearest Bella, you are beautiful! What a lovely Western Painted Turtle you are, gorgeous over and under. And what a story you have to tell! I am so very glad and grateful that you now have the home and life you deserve, and have always deserved, after such awful early upbringing in that school. Where was that teacher? We're so glad that Grandpa rescued you and brought you home! Now you live happily with fish and frogs in a koi pond, and you even get hand-fed live meal worms! You and your family members, all species, all love each other very much, don't you. What a wonderful home you all share! Congratulations, darling Bella, on being chosen today's Pet of the Day! We hope you and your dear humans and fish and frogs and all your family and friends are enjoying a fine celebration, full of fun and lovies and all your favorite games and treats, even more hand-fed live meal worms! Last edited by phesina; 02-05-2019 at 07:52 PM. 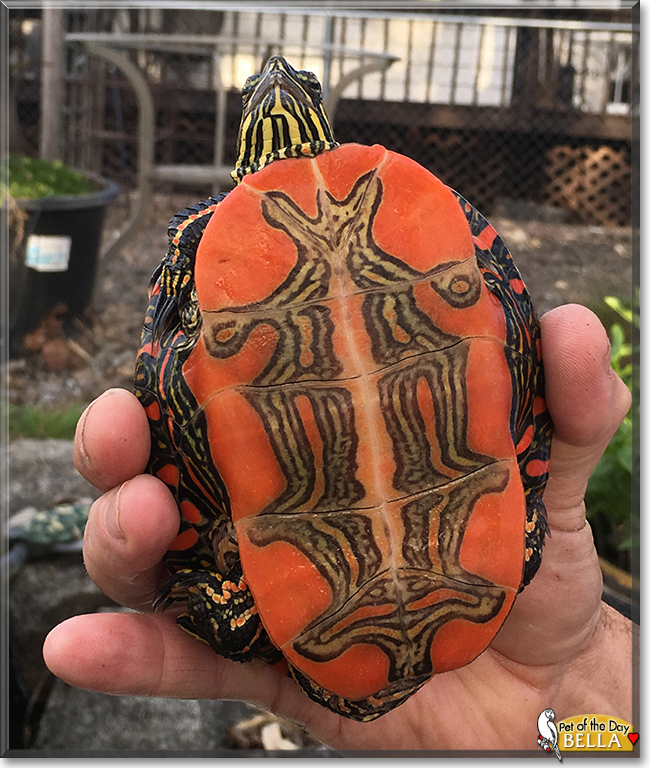 What a beautiful Western Painted Turtle you are, Bella. I a so glad you don't have to live in those horrible conditions anymore.